Today’s look at Maine lighthouses ventures a bit farther afield than some of our others, but to a place many of our guests go, after a few days at Brewster House Bed & Breakfast in Freeport. It is Bass Harbor Head Lighthouse, on Mount Desert Island (not far from Bar Harbor, Maine), after which our Bass Harbor suite is named. 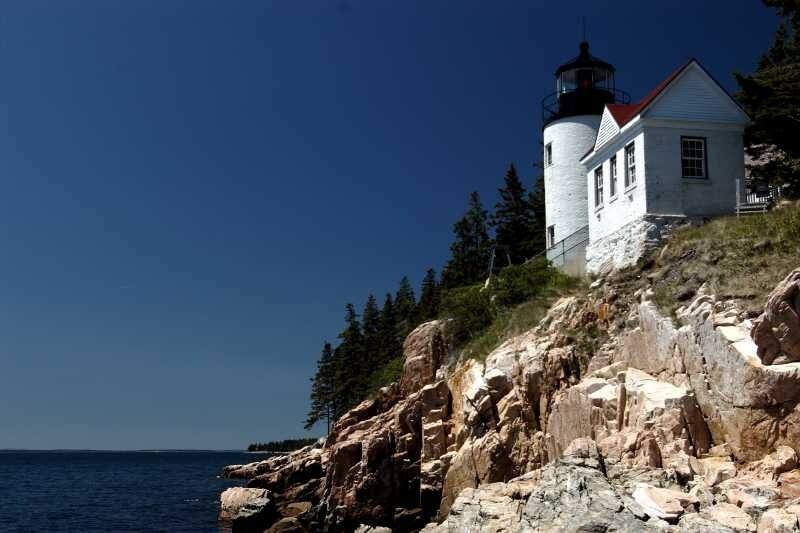 Perched high on the rocks, overlooking Bass Harbor, stands the picturesque lighthouse. The harbor is very accessible, but the light was needed to navigate the entrance. In 1857 the land was acquired and in 1858 a 32 foot tower constructed, and its fixed red light was lit. Driving into the parking lot, visitors are often puzzled about where the lighthouse is located, as, looking in the sky, there is no tower visible. Because of the terrain, the parking lot sits above the height of the lighthouse, and only the top part of the tower is visible to arriving guests. Unlike many modern lighthouses, the keeper’s house at Bass Harbor remains a residence. Visitors can walk down the paved pathway from the parking lot, but must stop near the keepers house, to avoid disturbing the occupants. Often this can frustrate photographers, as they can not stand far enough back from the tower to get it all in the picture, but can not go farther to change the perspective. Somewhat less noticeable, is the dirt path through the wooded area at the opposite end of the parking lot (near the public restrooms). It leads a short distance through the woods, to a wooden staircase leading down the cliff, to the rocks below. 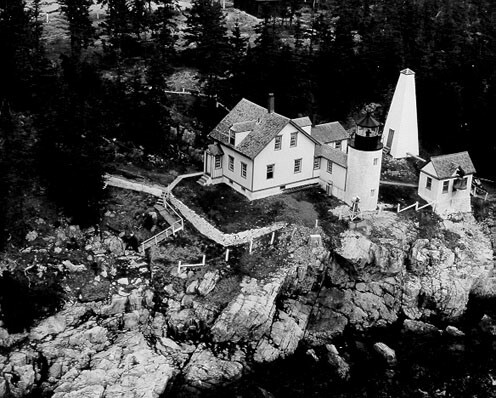 From this angle some of the most dramatic photographs of Bass Harbor Head Lighthouse may be obtained.